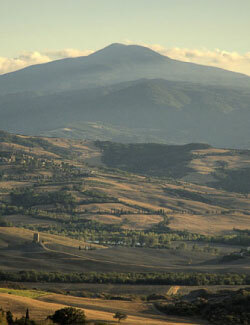 In this itinerary you’ll discover the nature trails on Mount Amiata. On the summit stands a monumental iron cross commissioned by Pope Leone XIII, erected in 1910. Thanks to the morphology of the territory, there is an exceptional 360 ° panoramic view. From the top, the vista includes Siena, Monte Argentario, the island of Elba and Gran Sasso. Heading down the mountain to Piancastagnaio, discover the Aldobrandesca fortress followed by a visit to the Pigelleto nature reserve and its white spruce forests and the Siele Mine. Last but not least, you’ll discover Castell’Azzara - also linked to the Aldobrandeschi family - and the old mining centre as well as the spectacular Sasso Colato cave and its remarkable stalagmites.